NEW PRICE REDUCTION!!! 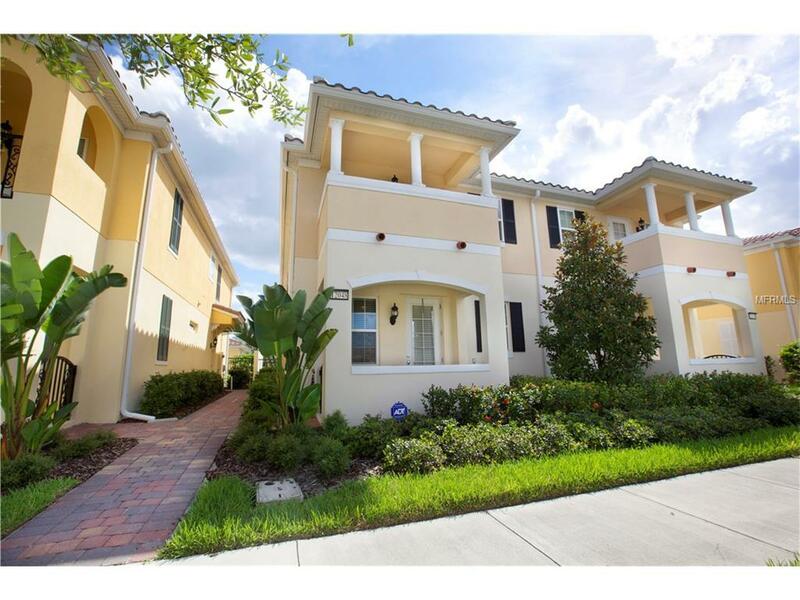 COME AND VISIT THIS STUNNING TOWNHOME LOCATED IN VILLAGE WALK AT LAKE NONA, A RESORT-STYLE COMMUNITY. FULLY UPGRADED WITH GRANITE COUNTER TOPS IN KITCHEN AND BATHROOMS, 42" WOOD CABINETS, ORNATE HAND RAILS ON STAIRS, CROWN MOLDING, ELEGANT PLANTATION SHUTTERS ON BACK SLIDING DOOR, BLINDS ON ALL ROOMS, ELEGANT STONE ACCENT WALLS IN GREAT ROOM, STAIR AND SECOND STORY LANDING. ANGLED 18" TILE ON FIRST FLOOR. THE DETACHED 2 CAR GARAGE IS TILED WITH SEALED PAVERS ON DRIVE WAY, PATIO AND MAIN ENTRANCE WAY TO FRONT DOOR. MASTER SUITE IS LOCATED ON 2ND FLOOR WITH BALCONY AND WATER VIEW, PERFECT FOR AFTERNOON RELAXATION. VILLAGE WALK IS A 24/7 MANNED GATED COMMUNITY THAT FEATURES IT'S OWN GAS STATION, 2 POOLS, TENNIS AND BASKETBALL COURTS, COMPLETE FITNESS CENTER, DELI-MARKET/RESTAURANT, BEAUTY SALON, DRY CLEANERS AND PHOTOGRAPHY STUDIO. GREAT LOCATION NEAR MEDICAL CITY, ORLANDO INTERNATIONAL AIRPORT AND SHOPPING, EASY ACCESS TO TOLL ROADS 417 AND 528, MAJOR THEME PARKS AND CENTRAL FLORIDA BEACHES. GREAT PUBLIC AND PRIVATE SCHOOLS (PUBLIC SCHOOL BUS PICK UP AND DROP OFF WITHIN VILLAGE WALK FOR PARENTAL CONVENIENCE). VALENCIA COMMUNITY COLLEGE, UCF MEDICAL CAMPUS, VETERANS HOSPITAL AND NEMOURS HOSPITAL 2 MILES AWAY! Additional Lease Restrictions Please Contact Hoa At 407-816-2704 For Details. Pet Restrictions Please Contact Hoa At 407-816-2704 For Details. Listing provided courtesy of Four Corners Realty Group Llc.